This process needs to be done from the command line so ssh needs to be enabled on the server. This can be done from vSphere Client. If Remote Host: means there is no syslog forwarding set. At this point, syslog has been restarted, however, tcp is blocked by firewall by default. It would be wise to just let TCP traffic thru firewall but I had difficulties doing so. If you are on an internal network, you may be ok. This is all the changes that need to be done on ESXi. You can log out now. On Logstash conf file, just add an input of type tcp matching the port defined in host. Restart Logstash and let it warm up. If everything went well, we should see events trickling into Elasticsearch. Better yet, lets point a browser to Kibana and see them instead! Not too bad. From here, the next logical step would be to create a custom mapping for EXi host and build a dashboard on top of this. Neat. This pretty much settles the next post. This entry was posted in elk stack, syslog forwarding, vmware monitoring and tagged elasticsearch, kibana, logstash. Bookmark the permalink. Same here, where i need to input the tcp port. I have a syslog.con and a lumberjack-input.conf. I just double-checked my settings and they are exactly as shown on post. You could also test by sending TCP traffic to Logstash from anywhere else. Logstash usually behaves very well. The ESXi configuration is more intricate, however. Thanks for getting back to us Mario. Step 10 is where I’m stuck. Can you post your full logstash config please? I’ve tried something like this but still not seeing anything. Actually success this time, I started everything from scratch on another linux server and appears to be working. I am very glad you guys got things sorted out. Backup the configurations and experiment away. G’luck. I took a look at Sexilog afterwards but never got to write about it. Very nice solution to some problems but, at the time, I wasn’t aware of it. I wish I was still fiddling with ELK thou… Cheers. On step 3, you set up syslog to log to that ip, port. On step 10, you set up logstash to ‘listen’ to that ip, port. Maybe think about it like this; syslog’s output is that IP/PORT. Logstash’s input is that IP/PORT. You just defined such in Logstash’s conf file and fire it up. 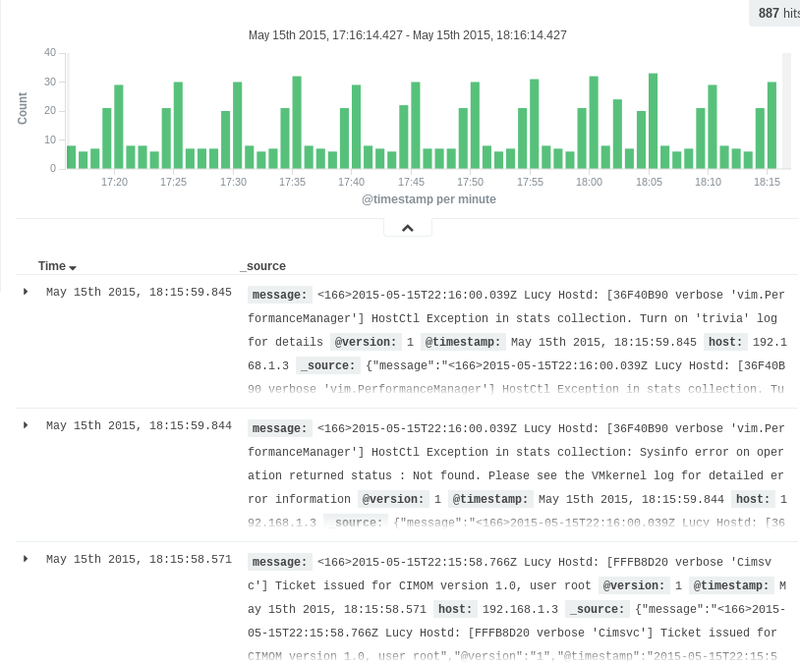 I’m actually understand that command but I’m working with the Kibana Ui and I wonder how can I find the Logstash conf file. Is that I will go to the Kibana console and type in those commands on step 10 ? I think I got it sir. It is I will use a text editor to config the file name logstash.yml ?